Have you ever raised funds for your church, another organization, or a mission trip? Maybe you felt uncomfortable about asking people to donate money. It’s time to change the way you view this important task. Henri Nouwen was born in Holland in 1932 and ordained a Catholic priest in 1957. He obtained his doctorandus in psychology from Nijmegen University in The Netherlands and taught at Notre Dame, Yale, and Harvard. He experienced the monastic life with Trappist monks at the Abbey of the Genesee, lived among the poor in Latin America with the Maryknoll missioners, and was interested and active in numerous causes related to social justice. After a lifetime of seeking, Henri Nouwen finally found his home in Canada, as pastor of L’Arche Daybreak – where people with intellectual disabilities and their caregivers live together in community. 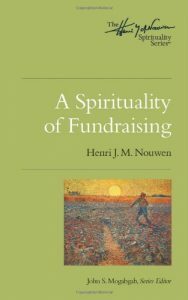 Henri Nouwen wrote over 40 books on spirituality and the spiritual life that have sold millions of copies and been translated into dozens of languages. His vision of spirituality was broad and inclusive, and his compassion embraced all of humankind. He died in 1996. His work and his spirit live on.